Faith2Green, the umbrella organization for The Coalition on the Environment and Jewish Life of Southern California (COEJLSC), is committed to responding to the complex environmental problems we all face. Faith2Green partners with the community to be an instrumental force in combating these issues. From implementing sustainable food systems to installing astro-turf lawns to reduce water, Faith2Green is actively fighting environmental degradation. One prominent way they bring the community together is through their Environmental Education & Reception Series. The latest in this series, “Lighting & Energy Efficiency: Improving Our Business & Communities” brought together a knowledgeable cohort that spoke on different measures of energy efficiency. 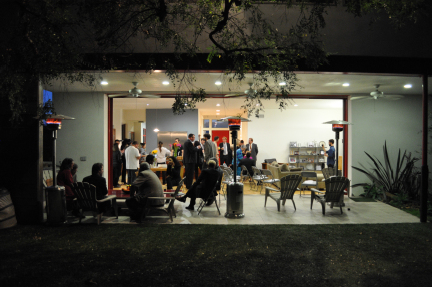 The event took place in the home of Faith2Green’s Board President, Lee Wallach. Wallach’s enthusiasm for using the power of human connection to build environmental solutions created a dynamic setting for the occasion. The event’s highlight was the panel discussion led by Frans Otten (Chairman of Lemnis Lighting Asia), Greg Johnson (President of Kilawatt Technologies, Inc.), Michael Shull (Superintendent of LA Dept. of Rec and Parks), Moritz Hammer (Senior Associate at KGM Lighting in LA), Dr. Travis Longcore (Associate Professor at Univ. of Southern California), and Jeffrey Bolan (Energy Efficiency Program Supervisor at LA Dept. of Water and Power). Each panelist had a distinct piece of information to share. Not only did they explain energy efficiency measures, but also discussed the significance of how the human perceives light. To illustrate this point, Frans Otten doesn’t call Lemnis a lighting company. Rather, he describes it as a "Vision Company," because “What is light without the eye?” In support of Lemnis, Dr. Longcore expounded on the advantages of using red instead of the commonly used blue LED light; humans and many other species alike respond better to the warmer, red lights. Using the red spectrum in lights increases our perception of color vibrancy, a key component of Moritz Hammer’s work. Hammer designs spaces using human perception of light as a basis for how to best light an area. Additionally, using the light that is more readily perceived by the human eye reduces overall energy required because we can see better with less light output. Finally, blue light tends to suppress melatonin production, which could play a key role in how many people face battles with sleep and mood disorders. Jeffrey Bolan and Michael Shull are making huge efforts to reduce energy in their respective organizations. Bolan is a role model for other municipalities. So far this year, he has created a 36GW hours saving – a huge success! The majority of these savings resulted from lighting incentive programs with commercial businesses. As the market for high quality LED lights increases (ie Lemnis Lighting), Bolan is pressing to include LEDs in incentive programs. Michael Shull is also looking to LED lighting for energy saving solutions. By early 2015, the Venice Beach boardwalk will be adorned with LEDs. Shull is facing a 9 million dollar per year power bill, so taking measures to put in high quality, low energy lights is critical. Beyond lighting, both of these men can use Greg Johnson’s Kilawatt Technologies as a model to further reduce energy through that analysis of HVAC and other equipment in modern buildings. Greg is seeing a minimum of 20% savings in the buildings he analyzes and optimizes, often without any additional expenditures! This event was a success thanks to the support of Lemnis Lighting Asia, Livingreen, The Adventure Capitalists, Community Assets Consulting, Gardein (for their delicious food) and of course Faith2Green.